I nominated one property for the 100 Worst Properties List: the ongoing embarrassment at 1101 Waters Ave. (southwest corner of Park Avenue). I’m not going to run out and take a photo of it myself right now, but click here for one at the Savannah Morning News. 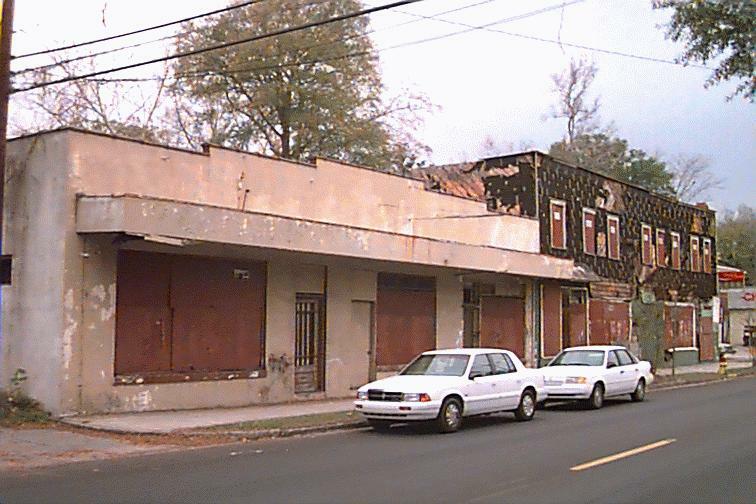 Chatham County lists the owners as Lester G. and Annie C. Jackson, but Lester G. Jackson, Jr., passed away a couple of years ago. The couple’s son, state senator Lester Jackson, has been the one speaking about the property in the Savannah Morning News the last couple of days. UPDATE: The property is actually divided into two pin numbers; click here for the other Property Record Card, which lists a value of $8,700. Because the building is continuing to collapse and is deemed a safety hazard, the city is moving ahead with demolition, which will then be billed to the property owner. Jackson said he has been negotiating the sale for about six years and the city has agreed to a compromise price, after separate appraisals were performed on the behalf of the city and his family. He declined to disclose the agreed-upon price. While the contract has been signed on his family’s end, he is still waiting on the city to finalize the deal, Jackson said. So the property is essentially the city’s now, despite “technically” still being in his family’s name, he said. “We don’t like to refer to it as vacant,” he said, adding that “eyesore” is a relative term. If this isn’t an eyesore, then I don’t know what is. Anyway, the tax value of improvements to the property bizarrely jumped from $17,100 in 2012 to $37,400 in 2013, even as the building crumbled. The land value has remained pretty much constant near $18,000 for over a decade. Is the city paying anything over the $55,100 assessed value? And why? And why would they even be paying that much? What will the city do with yet another property that would be better left in the private sector? Think about the Waters Avenue strip mall, the Hall Street property, the historic cottages that will be demolished for a new Central Precinct, and on and on. So why were city officials so patient in dealing with a dilapidated structure on Waters Avenue near Park Avenue that the city’s property maintenance inspectors had on their hit list for six years? Was is because they were too swamped with other tumble-down buildings to force the owner to appear before Recorder’s Court Chief Judge Tammy Stokes, who now handles the city’s building code docket and has the authority to compel owners to comply — or else? Was it because the owner, Annie Jackson, is the mother of State Sen. Lester Jackson III, who represents much of the city in the Georgia Senate? The demolition of this blighted property is a big step forward for Waters Avenue revitalization, but why were the property owners allowed to let it get into this condition? Why in the world would the city close any deal that rewards the owners for their negligence? The city’s property deals and the appearance of cronyism among well-connected folks have become an embarrassment. I’ve always liked Mayor Edna Jackson’s energy and enthusiasm about Savannah’s positive qualities, and I have been more than willing to give City Manager Stephanie Cutter time to settle in to the position. But they and other city officials are losing my confidence fast. If the city ends up paying good money for another property for which they have no viable plan, my confidence in our leadership will be pretty much have evaporated. UPDATE: Thanks to Anniken Davenport for pointing out that the property owners paid NO property tax in 2013 because of “exemptions” that totaled the same as 40% of the fair market value. Click here to see that property tax statement and here to see the one from 2011.